This article is about three-dimensional vector geometry. For the maze-solving technique, see Maze solving algorithm § Wall follower. For the traffic rule, see Priority to the right. In mathematics and physics, the right-hand rule is a common mnemonic for understanding orientation of axes in three-dimensional space. Most of the various left- and right-hand rules arise from the fact that the three axes of three-dimensional space have two possible orientations. One can see this by holding one's hands outward and together, palms up, with the fingers curled, and the thumb out-stretched. If the curl of the fingers represents a movement from the first or x-axis to the second or y-axis, then the third or z-axis can point along either thumb. Left- and right-hand rules arise when dealing with coordinate axes, rotation, spirals, electromagnetic fields, mirror images, and enantiomers in mathematics and chemistry. Right-handed coordinates on the right. For right-handed coordinates the right thumb points along the Z axis in the positive direction and the curl of the fingers represents a motion from the first or X axis to the second or Y axis. When viewed from the top or Z axis the system is counter-clockwise. For left-handed coordinates the left thumb points along the Z axis in the positive direction and the curled fingers of the left hand represent a motion from the first or X axis to the second or Y axis. When viewed from the top or Z axis the system is clockwise. Interchanging the labels of any two axes reverses the handedness. Reversing the direction of one axis (or of all three axes) also reverses the handedness. (If the axes do not have a positive or negative direction then handedness has no meaning.) Reversing two axes amounts to a 180° rotation around the remaining axis. In mathematics, a rotating body is commonly represented by a vector along the axis of rotation. The length of the vector gives the speed of rotation and the direction of the axis gives the direction of rotation according to the right-hand rule: right fingers curled in the direction of rotation and the right thumb pointing in the positive direction of the axis. This allows some easy calculations using the vector cross product. No part of the body is moving in the direction of the axis arrow. By coincidence, if the thumb is pointing north, Earth rotates in a prograde direction according to the right-hand rule. This causes the Sun, Moon, and stars to appear to revolve westward according to the left-hand rule. A helix is a curved line formed by a point rotating around a center while the center moves up or down the Z-axis. Helices are either right- or left-handed, curled fingers giving the direction of rotation and thumb giving the direction of advance along the Z-axis. The threads of a screw are a helix and therefore screws can be right- or left-handed. 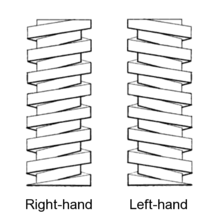 The rule is this: if a screw is right-handed (most screws are) point your right thumb in the direction you want the screw to go and turn the screw in the direction of your curled right fingers. When electricity (conventional current) flows in a long straight wire it creates a circular or cylindrical magnetic field around the wire according to the right-hand rule. The conventional current, which is the opposite of the actual flow of electrons, is a flow of positive charges along the positive Z-axis. The conventional direction of a magnetic line is given by a compass needle. Electromagnet: The magnetic field around a wire is quite weak. If the wire is coiled into a helix all the field lines inside the helix point in the same direction and each successive coil reinforces the others. The advance of the helix, the non-circular part of the current and the field lines all point in the positive Z direction. Since there is no magnetic monopole the field lines exit the +Z end, loop around outside the helix, and reenter at the −Z end. The +Z end where the lines exit is defined as the north pole. If the fingers of the right hand are curled in the direction of the circular component of the current, the right thumb points to the north pole. Lorentz force: If a positive electric charge moves across a magnetic field it experiences a force according to the right-hand rule. If the curl of the right fingers represents a rotation from the direction the charge is moving to the direction of the magnetic field then the force is in the direction of the right thumb. Because the charge is moving, the force causes the particle path to bend. The bending force is computed by the vector cross product. This means that the bending force increases with the velocity of the particle and the strength of the magnetic field. The force is maximum when the particle direction and magnetic fields are at right angles, is less at any other angle and is zero when the particle moves parallel to the field. Ampère's right-hand grip rule (also called right-hand screw rule, coffee-mug rule or the corkscrew-rule) is used either when a vector (such as the Euler vector) must be defined to represent the rotation of a body, a magnetic field, or a fluid, or vice versa, when it is necessary to define a rotation vector to understand how rotation occurs. It reveals a connection between the current and the magnetic field lines in the magnetic field that the current created. André-Marie Ampère, a French physicist and mathematician, for whom the rule was named, was inspired by Hans Christian Ørsted, another physicist who experimented with magnet needles. Ørsted observed that the needles swirled when in the proximity of an electric current-carrying wire, and concluded that electricity could create magnetic fields. An electric current passes through a solenoid, resulting in a magnetic field. When wrapping the right hand around the solenoid with the fingers in the direction of the conventional current, the thumb points in the direction of the magnetic north pole. An electric current passes through a straight wire. Grabbing the wire points the thumb in the direction of the conventional current (from positive to negative), while the fingers point in the direction of the magnetic flux lines. The direction of the magnetic field (counterclockwise instead of clockwise when viewed from the tip of the thumb) is a result of this convention and not an underlying physical phenomenon. The thumb points direction of current and fingers point direction of magnetic lines of force. The rule is also used to determine the direction . The index finger points in the direction of the velocity vector v.
The middle finger points in the direction of the magnetic field vector B. The thumb points in the direction of the cross product F.
For example, for a positively charged particle moving to the North, in a region where the magnetic field points West, the resultant force points up. For a rotating object, if the right-hand fingers follow the curve of a point on the object, then the thumb points along the axis of rotation in the direction of the angular velocity vector. A torque, the force that causes it, and the position of the point of application of the force. A magnetic field, the position of the point where it is determined, and the electric current (or change in electric flux) that causes it. A magnetic field in a coil of wire and the electric current in the wire. The force of a magnetic field on a charged particle, the magnetic field itself, and the velocity of the object. The vorticity at any point in the field of flow of a fluid. The induced current from motion in a magnetic field (known as Fleming's right-hand rule). The x, y and z unit vectors in a Cartesian coordinate system can be chosen to follow the right-hand rule. Right-handed coordinate systems are often used in rigid body and kinematics. Wikimedia Commons has media related to Right-hand rule. ^ a b Watson, George (1998). "PHYS345 Introduction to the Right Hand Rule". udel.edu. University of Delaware. ^ IIT Foundation Series: Physics – Class 8, Pearson, 2009, p. 312. Weisstein, Eric W. "Right-hand rule". MathWorld. This page was last edited on 22 March 2019, at 02:49 (UTC).